Facebook is changing the game for advertisers. In recent years, the social network has focused on improving its optimization algorithm and native advertising tools, which have allowed smaller companies to compete without having to invest in third-party ad tech. Automation features like auto bidding, auto placement and auto audiences have simplified the media buying and bidding process, so advertisers can spend less time doing intraday bid and budget changes. Instead, advertisers are turning their attention toward their ad creative, which is quickly becoming the driver for financial performance. They need to quickly solve problems like creative fatigue and audience saturation with fresh, high-performing creative or else their campaigns will fall flat. To achieve and sustain return on ad spend (ROAS) over time, you need to create 100x ads – breakout creative that drives outsized results. But, 95% of new creative will fail to beat the current best performing ad. That means you can’t just create one new ad concept, you need 20 new concepts in order to find a winner. 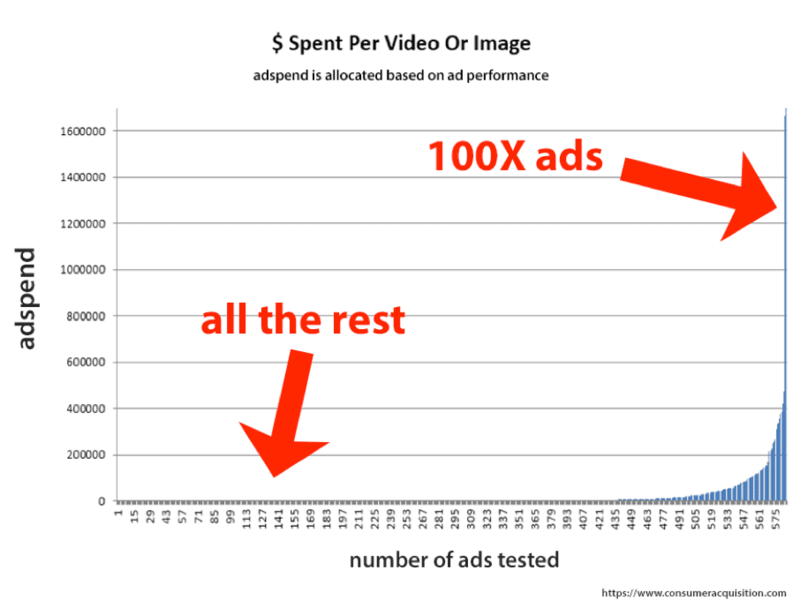 This begs the question – how do you scale the creation of new, high-quality ads? The answer lies in creative testing. Testing your ad creative is an in-depth and ongoing undertaking for a business, but it’s crucial for long-term campaign success. In this article, we explore three reasons why Facebook creative ad testing is essential. One of the key benefits of ad creative testing is to get a leg up on your competitors. But, before you start testing any creative concepts, I recommend auditing your top competitors to see which are running similar Facebook ad campaigns. Once you’ve identified a few key companies, take a look at the "Info and Ads" section on Pages. There, you can view any active ads your competitors are running and – most importantly – get a sense of what sort of creative they’re using. If you want to figure out which ads are high-performing you’ll need to use a paid tool, but doing so will give you better insight into what’s working and what’s not. Take notes, and even screenshots, of your competitors’ ads as you do this analysis. Using the successful ads, dig in to see if you can integrate any elements into your own creative. Maybe your competitors take advantage of video ads, like Benefit or Demo in Motion, and are seeing high conversion rates. Take this key information and integrate it into your future concept ideation – not only does this take some pressure off your creative team, but you’re also reducing risk because you already know this idea/concept works. Most importantly, doing this competitive analysis gives you a lay of the land to create a framework for what’s already being done in the space. When it comes time for you to create new concepts, you can start thinking outside the box to develop ideas that are totally unique and will set you apart from your competitors’ ads. This sort of fresh, breakout, high-performing creative is what will drive your ROAS. If you can create a concept that totally differentiates your brand from competitors, you’re poised to become an industry ad leader. If you’re not following Facebook advertising best practices or using the right creative, it’s possible to spend hundreds - even thousands - of dollars inefficiently. Of course, advertisers don’t want to waste their ad dollars. Rigorous testing of your ad concepts is one way to minimize the risk of putting a new ad to market and seeing your money go down the drain. First, let’s back up and talk about creating new ads. There are two key types of ads you should be creating: concepts and variations. Concepts are brand new, completely different creative concepts, which can result in supersized results – or big losses. Variations, on the other hand, are ads that reposition elements of a high-performing ad. Since they aren’t as drastic a change as concept ads, variation ads tend to have a smaller revenue impact, and also a smaller chance of revenue loss. In general, I recommend the 80/20 rule; spend 80% of your time creating variations of highly successful ads from the past, and the other 20% coming up with brand-new concepts to test. This allows you to create for the big payoff while keeping financial risk at a minimum. Now onto testing. We want to take these ad concepts and test, test, test until you find a winner. But, I’m not talking about split testing, here. I break my process into two key phases: simple variation testing and advanced variation testing. Simple variation testing is where you tear apart ads that are already successful to figure out what elements are driving results. Look at elements like calls to action (CTAs), buttons, text headers, image format, and video length to figure out what’s working best in your current campaigns. This minimizes the financial risk inherent with launching new ads and gives you best practice you can apply down to future ads. With everything you learned in the competitive analysis and simple variation testing process in mind, you can move onto advanced variation testing. This really gets into the nitty-gritty of your creative, where you’re testing things like start and end cards, colors, ad copy, background images, image layout and more. Again, the goal is to figure out which elements of your ad copy are driving the results. Your team then uses those findings to create new ads for your campaign that are based on quantifiable testing results. As discussed earlier, the vast majority (95%) of your new creative will fail to beat the current best performing ads. This means that only 5%, one out of 20 new ads, will deliver a good ROAS. To see the revenue you want, you can’t just use any creative - you need breakout creative that delivers tremendous results. Finding this 100x ad creative means you need to develop a lot of ads and extensively test them. Leverage everything you learned in the creative testing process, especially the various testing phases, to create (and create and create) new concepts. Ultimately, those breakout ad concepts are what will make you really stand out from competitors, drive revenue, and increase ROAS. It can be really hard to recognize these high-performing ads and creative concepts. It’s not an issue of "I think this ad will do better." Opinions don’t matter - but performance does. To get really good at creating new creative, you’ll have to commit to ongoing, rigorous testing of copy, video, and images. Variation testing, as mentioned above, is a great way to determine the best opportunities for ad success. Breakout creative often doesn’t look like anything special - until you put it into a live campaign and check the reports. Oftentimes, that one humble little ad starts to look very different from all the rest - standing out significantly and driving end results. Facebook ad testing can benefit your business in many different ways. It provides a blueprint for future creative strategies and can pay off financially as well. By analyzing the competition, testing variations, and ideating concepts, you can develop creative that allows you to stand out, minimizes financial risk, and improves return on ad spend. Facebook ad testing is undoubtedly a necessity to any campaign. Stop watching your ad spend go up in flames; start creating, testing, and strategizing for a more successful campaign. Brian Bowman is the CEO of Consumer Acquisition, which provides a creative studio, tiered fully-managed user acquisition services and SaaS tools for social advertisers. They’ve created over 300,000 videos and acquired over 150 million app installs and leads for companies like Glu, Mobilityware, Nickelodeon, JamCity, GSN, Wooga, UbiSoft, Checkout51, eBates and more.